Harry Judd, 26, Tom Fletcher, 27, Dougie Poynter, 24, and Danny Jones ,26, recently met up with Niall Horan, 19, Zayn Malik, 19, Liam Payne, 19, Harry Styles, 18 , and Louis Tomlinson, 20, on tour in America, but McFly revealed to Heat magazine they couldn't keep up with the younger boyband. 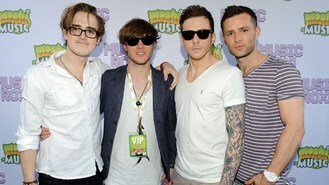 Tom said: "They're probably more rock 'n' roll than we are. Niall's a funny guy. I went to bed and they were still playing music." Harry added: "Me and Danny had a late night with Niall. I went to bed at 3.30am. "Tom was on his balcony and Niall said, 'Tom, come play some songs!' You were angry at the situation, because you wanted to go to bed." Tom protested: "I wanted to chill out." The band's drummer joked: "But instead you went, (puts on a grandad voice) "No, I'm going to bed!" The full interview appears in this week's Heat magazine, on sale now.